One of the nice things about the mail box in Singapore is that parcels like this fit in them. The postman open a door and he can place mail in all letterboxes even when those letters or parcels are too big to fit through the slot in the letterbox. Good design really. 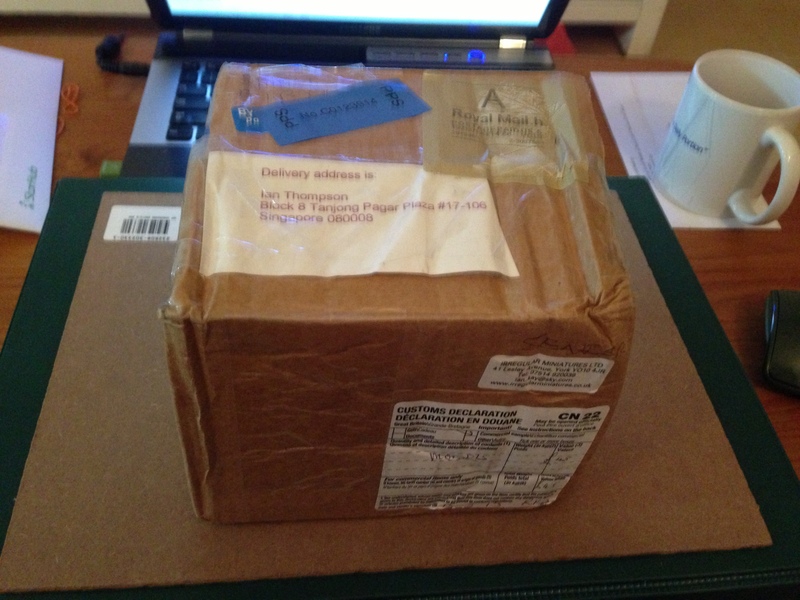 I received a parcel from Irregular Miniatures today. I ordered some stuff (unlike Navwar, Irregular accepts orders by electronic means). I ordered on 12 March 2013. 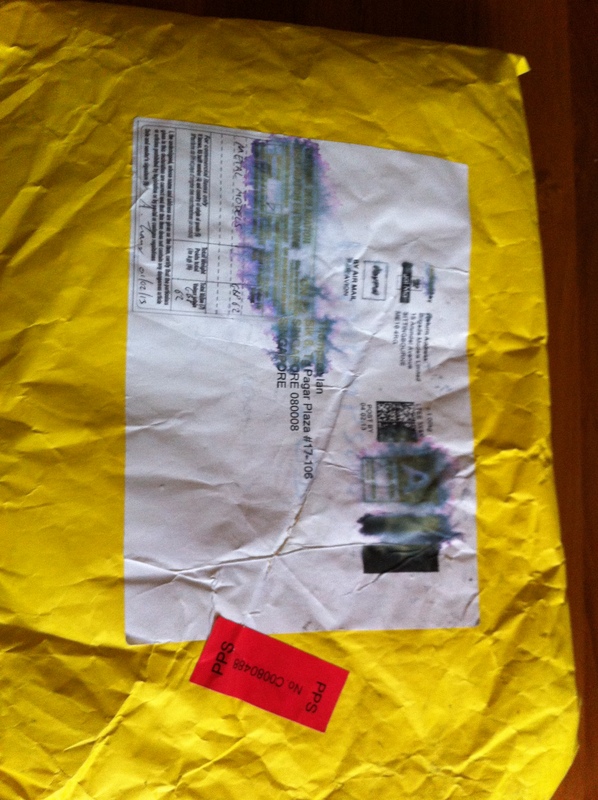 On 13 March 2013 Ian Kay of Irregular put my parcel in the post and it arrived in my letterbox here in Singapore today, 21 March 2013. I’m impressed and I do love the service from Irregular – they are one of the best. 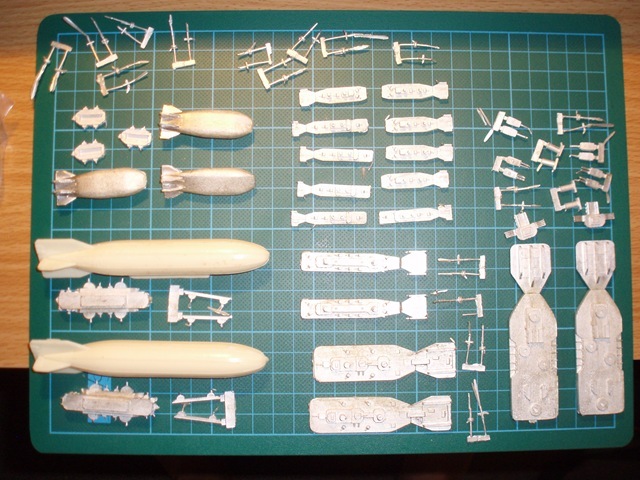 I’d ordered some 2mm terrain for the Peshawar project (1/1200th scale aeronefs and Land Ironclads – Victorian Science Fiction). 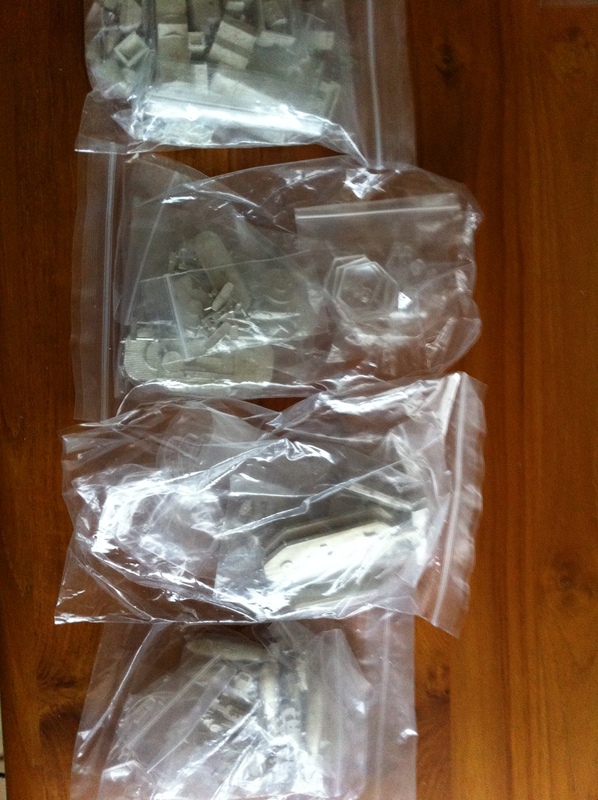 I also ordered some of Irregular’s 15mm ancient figures, in part because I have never painted any. I’ve painted their 2mm and 6mm figures (and I’ll be honest here, the 6mm were not my favourites – I was spoiled early on by first being exposed to Heroics and Ros too many years ago to remember). The 15mm figures will make up a Khmer DBA army and I will comment on them further later. The 2mm terrain was some villages and woods and again I’ll comment on those in a later post. The best was the 2mm train-set. I have painted some of that before in Oz and they look fine. They will fit in well to then Colonial world that is Peshawar, my Victorian Science Fiction universe. Now I am just waiting for my copy of Shipwreck which should arrive any day now, and my Indian and Chinese navies. Judging from the past performance of Navwar, my letter should arrive in their shop tomorrow or Monday then 7 to 10 days later a parcel should arrive here. In the meantime, tomorrow night will be set aside for a serious planning session to work out how to handle the 2mm terrain. Until that post appears here, goodnight! With several kilograms of unpainted lead waiting in the man cave, I am still unable to decide what to do next. 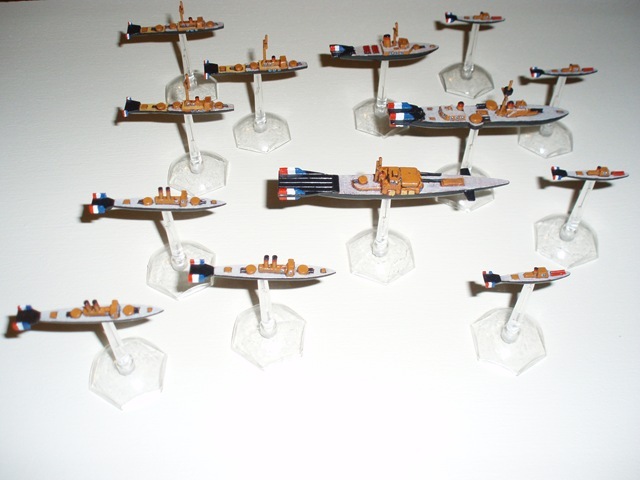 I looked further at the modern naval and even prepared an order for a Chinese and an Indian modern fleet along with the addition of a carrier or two for each and some aircraft models. I then duly faxed the order to Navwar only to have the fax machine fail to deliver (Navwar has the most archaic ordering process and to be honest, the best way to order is to send them a letter ((actually, I am about to post that failed fax – I’ll report on the turnaround time in the future here in the Hole)). 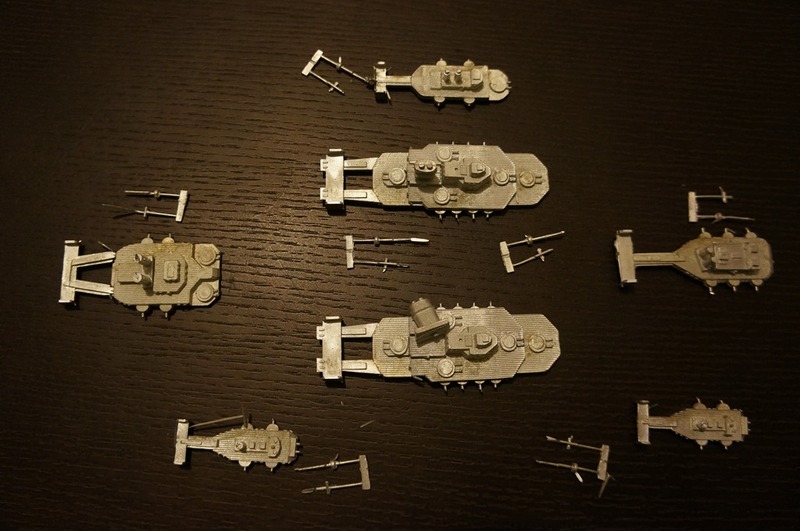 Last night I received another batch of 2mm buildings from Brigade Models to use with the aeronefs and land ironclads. I am still trying to think about how to use them effectively. 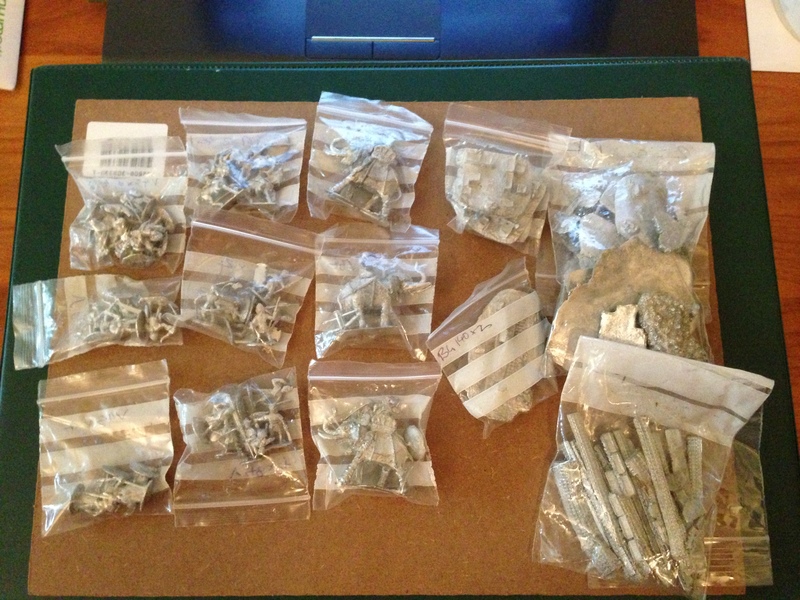 Mind you, I am fairly sure that I want to do something with them, so sure that I ordered some more 2mm terrain from Irregular Miniatures on Tuesday. Ian Kay of Irregular let me know that they were put in the post yesterday so I expect to see them here in Singapore by the middle of next week. Whilst considering possible projects, I have been thinking about another 15mm DBMM army or two, especially as I really liked the look of the Khurasan Miniatures I have seen. I even considered some of the earlier American types from his ranges. It then occurred to me that as I was sitting in Asia, why not do an Asian army – say Cham; or Thai; or Vietnamese; or Indonesian; or Malay. Interestingly, I noted that Irregular Miniatures made Cham and as I had never tried painting any of his 15mm figures before, I thought I would give that a go. I therefore calculated a DBA Army for the Cham and ordered the figures off Irregular. They sell their figures individually which was nice – nothing left over from that for the spares box. I even called up Paradigm Inifitum here the other day to see whether they had sold all the Plastic Soldier Company 15mm boxes that were not moving at the warehouse sale – let’s just say we are negotiating. Anthony has 20mm though so I am still really undecided about scale for World War 2. It’s that time of the year again, Brigade Models are having their now traditional and annual XMAS Sale (I say XMAS as that is how it is called on their front page). Brigade are offering 15% off everything – and 25% off their Celtos stuff. What’s tempting for me? 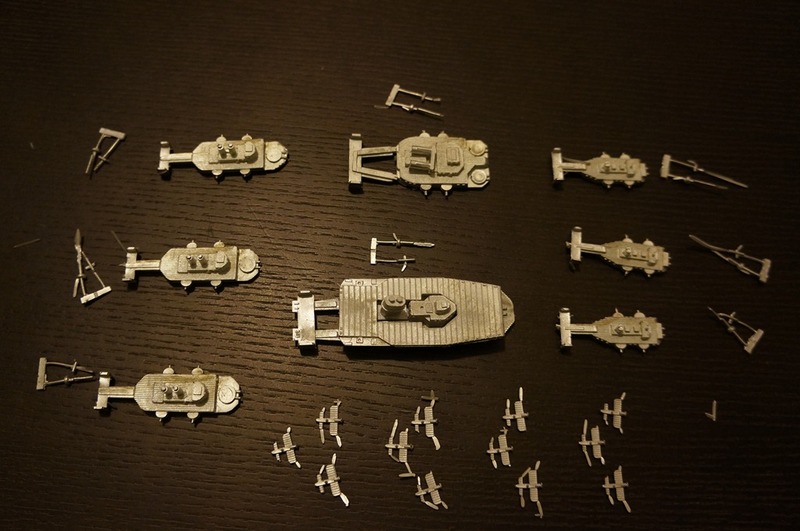 Aeronef, Land Ironclads and 6mm SF in particular although I am a little partial to the Iron Stars range as well. If I was looking at purchasing Aeronefs, then I would have to consider either expanding my American and Japanese fleets or perhaps adding a Scandinavian fleet to the mix. On the Land Ironclads front, Russian Empire looks really neat as well and something I could merge in with my Aeronef fleets when I get around to working on Peshawar again. Then there are the 6mm Science Fiction items. I already have (along a one-day cricket theme) the PacFed and waiting for paint British ONESS. Then, along a football theme (or what will be a football theme), EuroFed – the Italian end in particular. 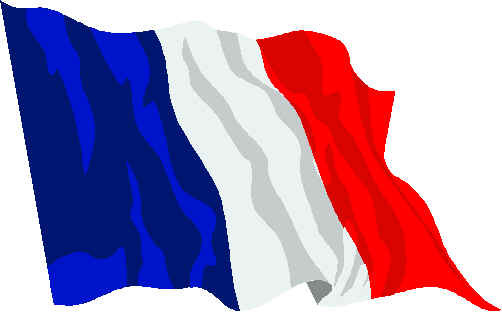 Of particular interest then is perhaps the German or CDSU. These 6mm armies work really very well with Future War Commander. The Iron Stars stuff is just nice – really nice. So much temptation, so thin a wallet, so little painting time! The rest of the parcel from Brigade Models was the Americans to face off against the Japanese. As with the Japanese, I purchased two fleet packs. The American fleet packs are battleship heavy which makes them an interesting opponent for the Japanese. 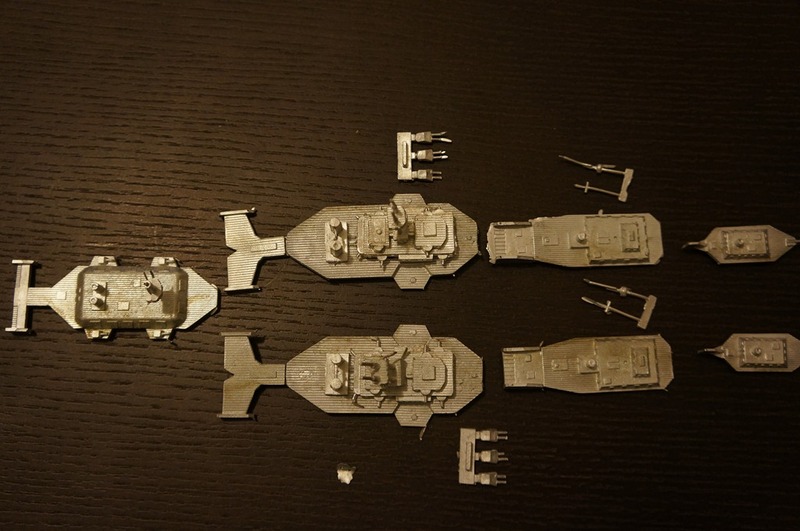 I am planning on a paint job on these that is reminiscent of the Great White Fleet. If these paint up as well as I expect them too then I will definitely be adding to these vessels and then by default, the Japanese I discussed yesterday. As I mentioned, I am planning on painting them based on the colours of Teddy Roosevelt’s Great White Fleet which circumnavigated the globe early in the 20th century, calling into Sydney amongst other places. 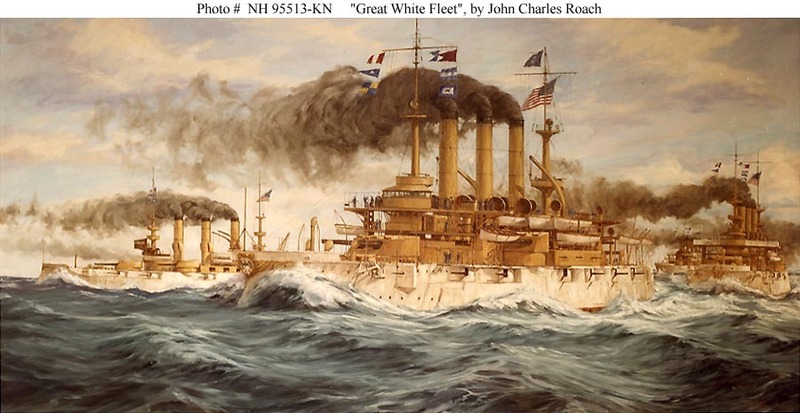 Let me leave you then with an illustration of the Great White Fleet. As one of the main protagonists in my Peshawar Campaign, I selected the Germans. In Victorian times the Germans were very active creating a nuisance in Europe and trying to compete with the French and English in building overseas empires. 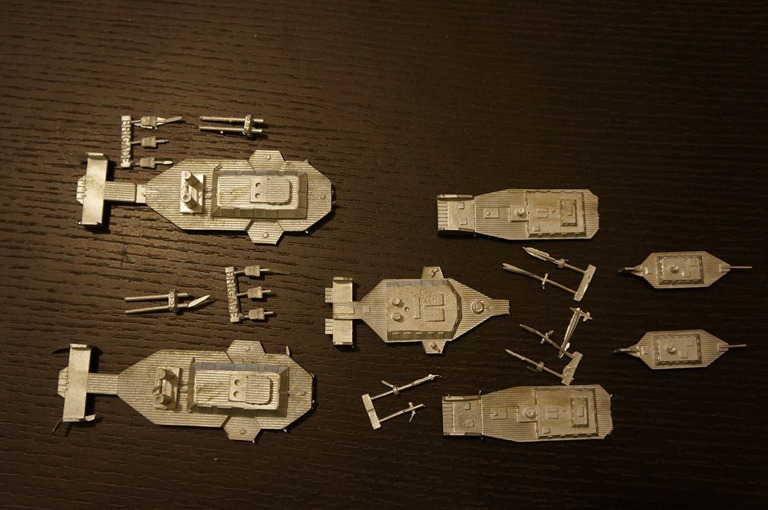 Can’t wait to get paint on these guys and see how they look with the German Land Ironclads and the 2mm infantry. France still maintains a large and diverse empire and because of that she needs to maintain a large fleet of R-Matter Aeronef as well as a fleet of Aerostat bombers. The Empire is spread over a large distance, encompassing territory in Africa, the Americas and the Far East. The Service Aéronautique, as the traditionalists refer to it avoiding the more commonly used term in the popular press of the Armée de l’Aeronef, needs to maintain a large fleet of cruising type vessels to keep the peace in the far flung reaches of the French empire as well as to provide vessels large enough to withstand not only the deprivations of likely foes but also, and perhaps more importantly, be big enough to impress the natives. To that end, the Armée de l’Aeronef tends to prefer lighter armoured craft than their other European opponents, lighter craft that rely on speed rather than armour to win the day. These craft, however, carry effective armaments and are capable of meeting the best vessels of the other European powers on an equal footing. The French are also at the forefront of the development of fixed wing craft as part of their Service Aéronautique force. As a result, they maintain several squadrons of these craft. They have also developed the means to carry these aircraft some distance, using converted Aerostat for that purpose. These Aeronef are generally arranged into flotillas on an ad hoc basis, depending on the tasks that need to be undertaken. Generally a flotilla will contain from two to six vessels and several flotillas may be combined into a battle group to meet specific threats or operational needs. Fixed wing aerocraft are also organised into squadrons and assigned to the flotillas as needed. Blimps, Dirigibles, or similarly Aerostat are monstrous airships kept aloft by huge gas-filled bags, frequently encased in a solid structure. Neither fast nor manoeuvrable, these awesome craft can carry a payload that brings riches in peace time, or a destructive cargo of death in war… Most major powers use their Aerostat as ground attack bombers, though some powers (such as the United States and Germany) with limited R-Matter resources are forced to use Aerostat in other capacities.